Sure, he tried to stab some Israelis. But he was such a sweet child! Ishaq Badran was described simply as a “terrorist” after stabbing an Israeli near the Damascus Gate in occupied East Jerusalem on Saturday. 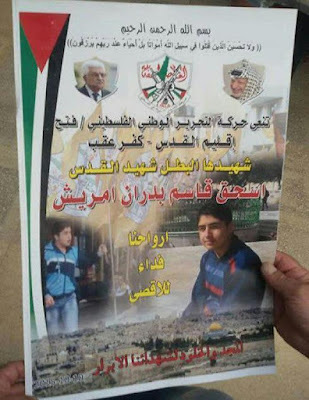 But in the mourners’ circle at his home in the city’s Kufr Aqab area, a more complex picture emerged of the 16-year-old, and what has caused others to take part in a wave of stabbings that has shaken Israel and threatens to turn into an all-out Palestinian uprising. Ishaq, a student at an Israeli vocational school who was shot dead by Israeli police, was lauded as a “hero” and “martyr” by the mourners. He was, said those gathered at his home, simply acting to defend Islam’s third holiest site, the Aqsa mosque, situated on an area revered by Jews as the Temple Mount. As dates, a traditional mourning food, were passed around, Ishaq’s close friends described him as an introverted, polite teen who liked weight-lifting and swimming. The oldest of six children, he prayed regularly and encouraged his friends to join him, friends said. He was not affiliated with any Palestinian faction or organisation, something he had in common with other Palestinians carrying out recent attacks seemingly of their own free will. Mr Badran said that his son had been deeply upset by reports that a settler had stripped the hijab off a Muslim woman in the Old City of Jerusalem last Wednesday. The reports, which could not be independently confirmed, soon spread on Palestinian social media. “He spoke to his mother about this and cried,” Mr Badran told The Independent. “He was crying, saying: ‘No one is defending these women’.” The woman was shot as she tried to stab an Israeli man, according to Israeli police. A friend of Ishaq’s, aged 13, said he was “extremely upset” when he saw him on Thursday and Friday last week. “We were looking at pictures of martyrs. He said that Fadi Aloun was killed in cold blood,” he said, referring to a Palestinian shot by Israeli police on 3 October for what Palestinians believe was no reason. Israeli police say he was killed after he stabbed an Israeli. What is the “more complex picture” that has emerged from this “reporting” that indicates that Badran was not a terrorist? A young man decided “seemingly of his own free will” to murder Jews. Which means that, yes, he is a terrorist. He is a terrorist even though he lifted weights. He is a terrorist even though he liked to swim. He is a terrorist even though he liked to pray. He is a terrorist even though he was respectful to his parents. There is one other thing that we learn from this article – that incitement is deadly. It wasn’t only social media that reported that a woman stabber last week had her hijab removed by a “settler.” It was the mainstream Arab press, as I reported at the time. There are literally no journalistic standards in Palestinian Arab media. Multiply this by the thousands of bigots and haters on social media, the rumors that have swirled after every attack become “facts” in the minds of young people who feel they must avenge the baseless lies. Arab incitement is what ended up killing Ishaq Badran. And Arab incitement is the least-reported story – one ignored by not only the media but by politicians and so-called “human rights” organizations. Their refusal to mention the incitement results in more deaths. Lies about the Temple Mount, lies about Israeli defensive actions, lies about the Jewish communities across the Green Line, antisemitic lies, and hundreds of lies that are promulgated every day in Arab media and Palestinian officials, are the engine of the violence. Combined with the honor/shame dynamic of Arab society and you have a surefire recipe for terror attacks. How can self-respecting people act otherwise when they are brainwashed by a daily avalanche of incitement and hate and lies? But the Independent will not cover that story. The Independent, and virtually all Western media, will not accept the notion that their compatriots in Arab media are not only willing but anxious to make up facts – like the “ripping off hijab” lie or the “she only had an electrical fire in her car” lie or the ever popular “they opened fire for no reason” lie. Westerners cannot wrap their heads around an entire society that was built on myths and lies combined with honoring murderers. The media cannot be bothered to research the facts for themselves, thinking that both sides must have some basis for their claims and the truth must be somewhere in between. Media like The Independent are partially responsible by giving credence to the lies, and by not reporting on the fact that one side’s claims are so often spurious that each one should be reported only with a disclaimer. Articles like this feed into the myth of Ishaq Badran’s heroism, not his terrorism. The Arab media lies. The Western media abets the lies by reporting the ones they want to believe and ignoring the ones that are too over the top for any sane person to swallow. These lies have consequences – and often, the consequences are fatal.